10.30am-4.30pm (July to April), 7.30am-1pm (May-June) ; Closed on Sundays and University holidays. Largest collection of miniature paintings in India. 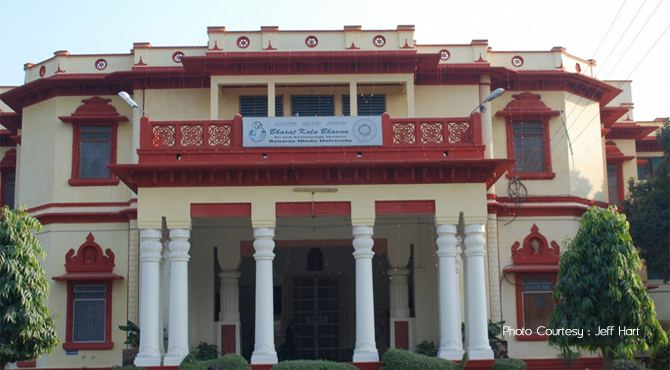 Bharat Kala Bhavan considered as the best university museum in India, is a popular attraction in Varanasi of Uttar Pradesh state. It is located within the campus of Banaras Hindu University (B.H.U). B.H.U, the largest residential university in India is the center for the study of Indian art, culture, music and Sanskrit. Bharat Kala Bhavan is an art and archeological museum which includes various archaeological materials, old manuscripts, paintings, ancient Hindu and Buddhist sculptures, plaster cast sculptures, bronze images, terracotta, beads, seals, metal crafts, ivory, jades and jewellery, etc. The museum is supposed to have the largest collection of miniature paintings in India. Established in 1920 AD, it's first Chairman was the greatest poet Rabindranath Tagore and the Vice-Chairman was his nephew Silpacharya Abanindranth Tagore. But, actually the whole credit for the Bharat Kala Bhavan and its development goes to Padmavibhushan Late Rai Krishnadasa, a renowned Hindi writer and a great pioneer. Though the visitors of the museum are mostly university students, graduates, research scholars and teachers, the museum has experienced many other visitors as well. Many eminent people like Mahatma Gandhi, Pundit Jawaharlal Nehru, Netaji Subhash Chandra Bose, Acharya Nandlal Bose, noted historian H. Cousin, famous archaeologist Sir Leonard Wolley and Mortimer Wheeler visited this museum. Bharat Kala Bhavan is a roomy museum with yellow and red colour. which is divided into various sections in the form of galleries, including Mahamana Malaviya gallery, Nicholas Roerich gallery, Chhavi (Painting Gallery), sculpture gallery, Nidhi gallery (treasure gallery), sculpture gallery, archaeological gallery, decorative art gallery and Banaras through ages gallery. The sculpture gallery in the museums exhibits clay objects, stone and bronze, cast metal objects and ancient terracotta items varies from ritual icons to toys to utilitarian objects date back to Indus Valley Civilization, Mauryan, Sunga and Gupta periods. The painting gallery is beautifully adorned with miniature paintings from the courts of Mughals, the Hindu Princess of Punjab Hills, pahari painting, paintings of contemporary artists etc. The Nidhi gallery displays crystal collection, sizeable collections of coins from the earliest times to our own days, beads, terracotta figurines, precious and semiprecious stones, jade objects, silver, enamel and rare jewellery. Banaras Gallery exhibits the collection of masks and jewellery that is used during the famous Ram Leela of the city and other fairs that occur through the year. There is also a rich collections of valuable textiles which consists of Benaras silks and brocades, embroidered shawls from Kashmir and rare chamba, rumals. There is a map of Banaras on cotton cloth that depicts the Pankroshi Yatra’s path. The Mahamana Malaviya gallery dedicated to Pandit Madan Mohan Malaviya (founder of the Banaras Hindu University) exhibits the important events of his life through photographs, books and other collections. The main hall of the museum has a figure of a man standing on one leg and one hand on his hip and lifting a mass of stone above his head, with one hand. The figure is said to be of Lord Krishna lifting Govardana. There are also many rare images that testify to the existence of Krishna cult in Kashi in the 15th and 16th century Gupta period. Timing: 10.30am-4.30pm (July to April), 7.30am-1pm (May-June) ; Bharat Kala Bhavan closed on Sundays and University holidays. Admission Fees: Rs. 10/- for Indians, Rs.100/- for foreigner. Camera Rs20. Video photography by the visitors is not allowed. Another attraction near is the magnificent Vishwanath temple (New Vishwanath Temple) located at within the campus premises, built by Birlas in 1966.